I received an ARC of The Other Half of Happiness from the publisher in exchange for an honest review. Check out my review of Sofia Khan is Not Obliged here! 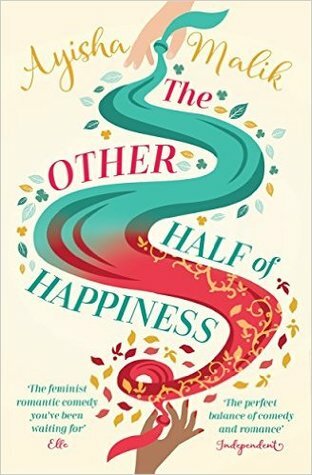 Last year I read Ayisha Malik's debut, Sofia Khan is Not Obliged, and really enjoyed it, so I was thrilled when I was approached by the publisher and offered the chance to receive an ARC of the sequel, The Other Half of Happiness. If you haven't read Sofia Khan is Not Obliged and you're planning to then I suggest you stop reading this review now; I try to keep my reviews spoiler-free, but as this book is a sequel there will be spoilers for the end of the first book here. One of the things I mentioned in my review of the first book was that it felt like two different books in one; the first half of the book was very much a Muslim Bridget Jones's Diary while the second half took a more serious turn, leaving me a little unsure as to the kind of tone the book was trying to hit. The Other Half of Happiness felt much more like the latter half of the first book, but Malik has still littered the story with a great sense of humour and Sofia is still such a fun protagonist to follow. Honestly, I found this book difficult to rate and see-sawed between 3 and 4 stars for a long time before I finally compromised and settled on 3.5. I loved the relationship between Sofia and Conall in the first book - the end of Sofia Khan is Not Obliged definitely gave me the warm fuzzies - and I'm still not sure how I feel about what happens to their relationship in this book. As the blurb suggests, Sofia discovers that Conall has a pretty big secret and that secret turned Conall into someone I wasn't sure I liked anymore. I appreciated that Conall became more complex, that he's definitely not perfect despite Sofia's idolisation of him in the first book, but the secret he keeps from Sofia is not okay (the keeping it from her that is, not the secret itself) and I got a little frustrated by the way he seemed to look down on Sofia's writing career in this book while expecting her to put up with his own passion project. This was especially confusing considering he was so supportive of her in the first book. What Sofia was lacking in romance in this book, however, she certainly made up for in the relationships with the other women in her life. I loved that Malik chose to explore the relationship Sofia has with her mother, in particular, as well as her sister and her friends. They're all incredibly supportive of Sofia, and it was nice to see this focus when so much of the first book was focused on Sofia's romantic life. So much of Sofia's life seems to have been focused on romance and marriage that, in this book, it felt as though she was finally able to pour more of her energy into the other areas of her life, such as her career. Unfortunately, I didn't quite enjoy this book as much as I enjoyed the first one. I loved the themes that Malik chose to explore, but so much of the book was Sofia being sad and moping; this is completely justified considering what happens, but it didn't make for particularly thrilling reading. In fact parts of this book felt like reading the first book again, with Sofia once again unsure where her life is going or what's going to become of her career - I desperately wanted her to use her own initiative more rather than simply jumping on the opportunities other people offered her. She's a bright woman, she just needed a bit of a kick up the backside from time to time. I did still like this book, though, and I recommend both Sofia Khan books - particularly if you enjoy contemporary, and especially if you're interested in reading a Muslim protagonist written by a Muslim author.